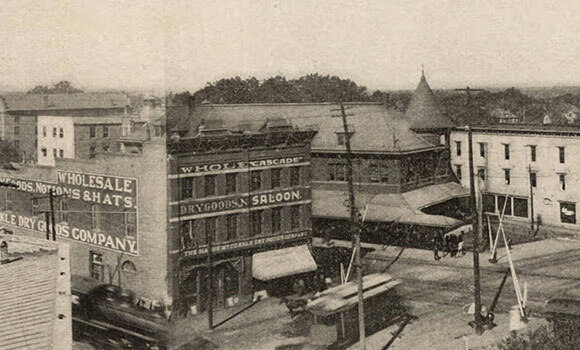 UNCG University Libraries is expanding on its popular “Hop into History” events with the newly launched “Well Crafted NC,” a project that documents the history of brewing in downtown Greensboro from the saloons of the 1890s to the craft breweries of today. Last fall, University Libraries launched Hop into History as a series of monthly pop-up historical exhibits – covering a variety of topics related to the city’s history – at Gibb’s Hundred Brewing Company in downtown Greensboro. Given the success of the events, the University Libraries team decided to take the project one step further. The first step? Location analysis, which involves looking through old city directories and newspapers to identify where bars were located. This fall, the team plans to employ and train a student who will conduct oral history interviews with the owners and brewmasters of the four – soon-to-be five – downtown breweries. Over the course of the semester, the team will publish the interviews, blog posts and a historical timeline at wellcraftednc.com. Updates will also be posted frequently on the project’s social media channels: Facebook, Instagram, Twitter and Tumblr. In April, during North Carolina Beer Month, University Libraries will host a free, community-wide launch event for the project in downtown Greensboro. Finalized details will be announced in early 2018. Well Crafted NC is supported by a $2,500 University Libraries Innovation and Program Enrichment Grant and is led by Lawrimore, Digital Technology Consultant Richard Cox and Digital Projects Coordinator David Gwynn. To learn more, visit wellcraftednc.com.